Originally from China, Minzi Li is an emerging curator and MFA candidate in Curatorial Practice at Maryland Institute College of Art. She has co-curated Legame, a workshop exhibition at the Venice Biennale, as well as the Baltimore-located group shows Land Trust, Everything Must Go and Dark Passenger. As the president of GradEx, she has organized and co-curated the off-campus group shows Mirror and Expression, and several student solo exhibitions. Having graduated with a CIDA-accredited degree in Interior Design, she uses her current research to focus on the rhythm, circulation, and lighting environment of exhibitions. Curated by Minzi Li, A Passing Scene features works by artists who examine the experiences of parting, and the ritualistic act of memorializing what is no longer present. These photographs, installations, films and archives act as a monument to the inevitability of ephemerality, to the lingering presence of all that has disappeared. Each artist in the show draws inspiration from family stories and offers a slice of their own cultural heritage; together, their artworks recreate diverse scenes of immigration, dislocation, atomic warfare, and the Holocaust. The works especially highlight how different geopolitical contexts have shaped these artists' lives-and how history has left its trail on each of them. A Passing Scene does not merely offer opportunities for visual spectatorship but, under the power and intimacy of both the artists' and viewers' experiences, it invites one to talk about these precarious experiences in a public space. The theater-like design of AREA 405 enhances the artist-led tours and other programs offered during the exhibition, allowing participants to immerse themselves in reconstructions and deconstructions of events and sites that have ceased to exist. Victoria, British Columbia-born writer and freelance designer Marcela Huerta is the author of Tropico, a collection of narrative poems memorizing the grief about her father’s passing as a second-generation immigrant and the daughter of political refugees from Chile. Her poems detailed described the struggling stories which was oral told by her parent and how memories could be so blurred and untrustworthy from different perspectives. Baltimore-based Japanese artist, Kei Ito, addresses issues of deep loss and intergenerational connection as he explores the materiality and experimental processes of photography. His work deals with trauma and legacy passed down from his late grandfather, a survivor of the atomic bombing of Hiroshima and a later anti-nuclear activist, in relation to current threats of nuclear disaster. Ito’s artworks lead the audience on a journey from grief and remembrance to hope. Grew up on the border between China and North Korea: a place mixed with Chinese and Korean. Shengxu Jin’s works offer audiences a window onto the concerns of third-generation Korean immigrant. Originated from his identity and the dislocation of his homeland, the “Void” feeling prompted the artist to create an illusory scene when he thought about the place where he belonged. Viewers could find the artist internalizing his subtle emotion of nostalgia in exploring his imagined world. Working with big data, historical research, and community partnerships to create expanded documentary projects, Nate Larson presents his personal worldview through his site-specific research. Born in Indiana, this Baltimore-based contemporary photographer harmonizes the insights of abstract datasets with the personal storytelling that comes from one-on-one relationships. His work is exhibited both nationally and internationally and is included in collections such as High Museum Atlanta, Crystal Bridges Museum of American Art, and many more. Jialin Yang and Ted Whitaker held and documented the last event with the local children at Micro Yuan. The artist, Ted and manager, Jialin invited these children to make their own tiny ceramic sculptures and bury them hese archival collections were made with the material from the last event held by the manager from Micro Yuan’er project. Beyond Beautiful: One Thousand Love Letters is on view at both Maryland Art Place (MAP) and AREA 405 from January 17 through March 10, 2019. 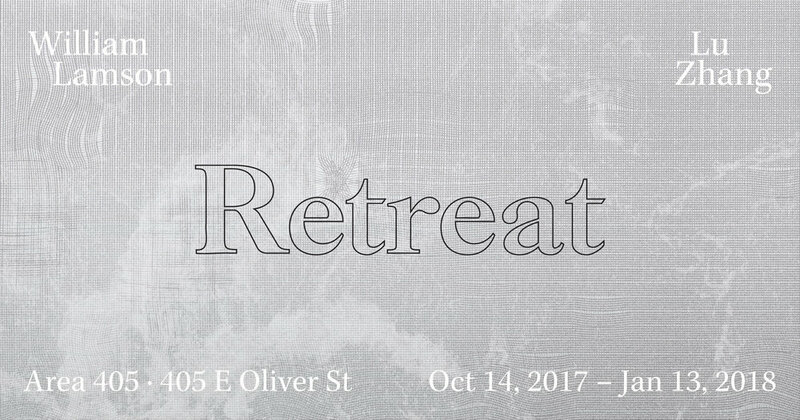 Retreat features the work of Lu Zhang and William Lamson, two artists whose practices specifically focus on immersing oneself in creating a studio practice that is the process. Where site specificity becomes studio and the work transforms throughout the exhibition itself. Zhang transforms the front gallery space into an expanded series of experiments that will remain in flux throughout the course of the exhibition. Lamson features projected videos in the back gallery. Curated by Stewart Watson, AREA 405 is pleased to be a part of the process of these two exemplary artists' work this fall. William Lamson was born Arlington, Virginia and lives in Brooklyn, New York. He is an interdisciplinary artist whose diverse practice involves working with elemental forces to create durational performative actions. Set in landscapes as varied as New York’s East River and Chile’s Atacama Desert, his projects reveal the invisible systems and forces at play within these sites. In some work he is the subject, directly performing in front of the camera, in all of his projects, Lamson’s work represents a performative gesture, a collaboration with forces outside of his control to explore systems of knowledge and belief. Lamson earned his MFA from Bard College, and teaches in the Parsons MFA photography program. His work has been exhibited widely in the United States and Europe, including the Brooklyn Museum, The Moscow Biennial, P.S.1. MOMA, Kunsthalle Erfurt, the Museum of Contemporary Art, Denver, and Honor Fraser Gallery in Los Angeles. In addition, he has produced site specific installations for the Indianapolis Museum of Art, the Center for Land Use Interpretation, and Storm King Art Center. His work is in the collections of The Brooklyn Museum, The Dallas Museum of Art, The Indianapolis Museum of Art, The Museum of Fine Arts in Houston and numerous private collections. William has shown with Robischon Gallery in Denver since 2006, most recently exhibiting in The Roaring Garden, Rotation this summer. His work has appeared in ArtForum, Frieze, the New York Times, The Los Angeles Times, The New Yorker, Harpers, and The Village Voice. He has been awarded grants from the Shifting Foundation, the Experimental Television Center, he is 2014 Guggenheim Fellow. Lu Zhang (b. 1983, Chongqing, China) is a multi-disciplinary artist who works in installation, sculpture, drawing, and text. Zhang’s conceptual approach takes specific sites or contexts as a point of departure. Recognizing the processes and people already present, she adapts her practice to respond to and temporarily inhabit a place. Zhang views her itinerant practice as emerging from an immigrant experience. She selects sites intuitively; sometimes responding to its historical context; other times tracing its physical manifestations, from scale to proportion or architecture; still other times Zhang mines a site’s function and collaborates with its workers. Zhang has received a grant from the Maryland State Arts Council for works on paper and been awarded The Trawick Prize Young Artist Award. In 2014, she became an inaugural recipient of a Rubys Artist Project Grant in Literary and Visual Arts. She has produced projects in Baltimore, Chicago, China, Finland, and the Netherlands. She has collaborated with ICA Baltimore and SPARE to produce publications and exhibitions; the George Peabody Library to launch a studio residency program, and The Contemporary to build resource initiatives for artists. Zhang received her MFA in Painting at the Frank Mohr Institute in the Netherlands and her BFA in General Fine Arts at the Maryland Institute College of Art in Baltimore. In Headspace, Lu Zhang engages the front room exhibition space of Area 405 in an expanded studio experiment. The installation presents fluctuating arrangements of drawings, prints, and sculptural objects. 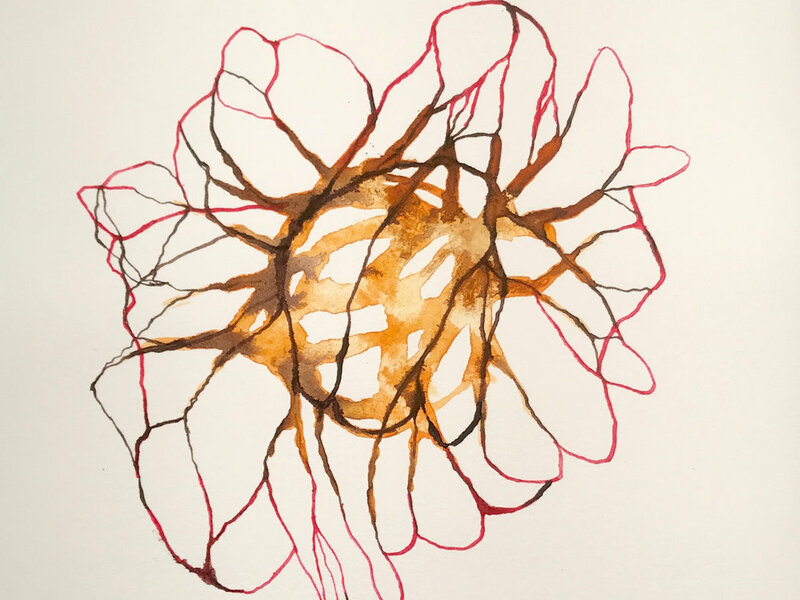 Through repeated movements and serial actions, Zhang treats drawing as akin to taking a long meditative walk. She employs shifts of scale, repetition, found materials, and cut-outs to frame the surfaces, textures, topography, and architecture of Area 405. Adapting the dependable modernist grid to be flexible, fallible, and vibrating, she presents moments of intense focus and gestures of play within the container of a studio. Throughout the duration of the exhibition, Headspace will remain in flux, activated through shifts, additions, reconfigurations, and visitor interactions. As the building houses 40 artist studios and hosts programs and exhibitions, Zhang interprets 405 East Oliver Street to be a site of making and a site of gathering. In this landscape, Zhang interrogates the role of the studio as a physical and mental space: as a site of learning, a site of confrontation, a site of routine, a site of doubt, a site of endurance, and a site of rest. Within this flexible context, she attempts to devise a way of working as a place to retreat to, a place for durational ceasing, a place to reconsider, establish language, and begin again.In Zhang’s conceptual practice, she takes specific sites or contexts as a point of departure. Recognizing the processes and people already present, she adapts her methods to respond to and temporarily inhabit a place. Zhang views her itinerant practice as emerging from an immigrant experience. She selects sites intuitively; sometimes responding to its historical context; other times tracing its physical manifestations, from scale to proportion or architecture; still, other times Zhang mines a site’s function and collaborates with its workers. 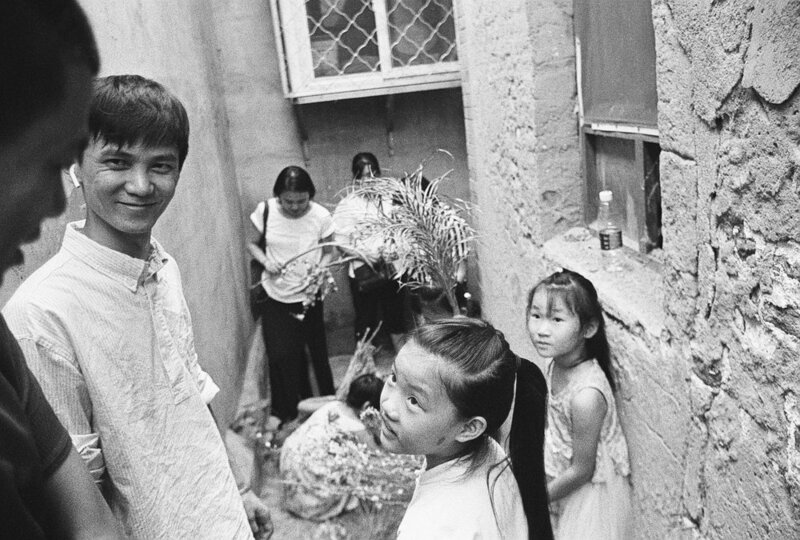 Using a procedure of gathering, sorting, arranging, and rearranging, Zhang’s methodology is rooted in research and sustained engagement. She applies this logic to her chosen sites with the resulting works taking a variety of forms from installations, to books, to drawings, to gestural interventions. By gathering imagery from a wide range of sources; from found materials to historical texts, to her personal archive, Zhang investigates the nature of work, the essence of language, and the poetics of place. Located in a 170 year-old artist-owned warehouse within Baltimore's Station North Arts and Entertainment District, AREA 405 is committed to showcasing and strengthening the vitality of the arts community within Baltimore and beyond. The preserved industrial character of our warehouse provides a distinctive setting for exhibitions as well as extensive studio space for the artists who create here (Oliver Street Studios). AREA 405's mission has been to produce, present and promote arts and cultural programming by offering a space for experimentation and collaboration for artists. AREA 405 has collaborated with cultural and community organizations, throughout the region and from around the world since opening its doors in 2003, host to tens of thousands of visitors in its nearly 15 years as an Artist Run venue. On April 30 AREA 405 is hosting the 7th Annual Art of Caring art auction in support of this worthy cause. This is the 5th year hosting the event at AREA 405. Last year The Art of Caring raised over $200,000 in funds, art sales and in-kind donations. More importantly, we raised awareness of the valuable work that CASA Baltimore City is doing to help our city's children who would otherwise fall through the cracks or get swallowed up in the quagmire of the juvenile court system. There are many ways you can help to support CASA and participate in bettering the lives of some of Baltimore's most vulnerable youth. Ways to support CASA include purchasing a ticket to the event, spreading the word about the Art of Caring, or attending an information session to learn how to become a CASA volunteer. This year, due to popular demand, we have extended viewing times and the auction will start during the week leading up to the Art of Caring main event on APRIL 30th. AREA 405 will have open hours from April 24-29 for viewing the artwork so generously donated by Emerging and Established Artists throughout the Baltimore region. These works are available for bidding and purchase in the CASA ART of CARING 2017 auction and exhibition. Many thanks to the dozens of artists who have participated in generously donating their works, some for the first time, and many as repeated donors to this worthy cause. Please come see to THE ART of CARING! Sarah Doherty's giant Plane from the Art of Caring 2016 - come see what we have this year! joins us at AREA 405 Friday, September 2nd in conjunction with September's back to school ALLOVERSTREET to have a fundraiser and talk about how artists are vital to today's democracy. Artists can help transform the opaque structures that thwart each community's potential.The first ELECT AN ARTIST was held in Richmond, VA this June to get artists - from poets to painters - to start thinking about running for local elected office and local board. Instead of oppositional thinking, our democracy needs Collaborative- Creative problem-solvers. Come enjoy a beverage and get creatively involved in running your community. Donations are welcomed to help support the upcoming ELECT AN ARTIST website as well as 2017 campaign of social sculptor (Lisa Austin) who plans to run for Mayor of Erie, PA.
Join us Friday for this important event! TRACES, Ni de aquí, Ni de allá (neither here, nor there) reflects the cultural complexities of Latinidad and examines the aesthetic values and characteristics of producing work under the Latin American umbrella. Featuring the work of ten artists currently living in Maryland, Virginia, Texas and Pennsylvania with diverse familia heritage across the Latin American diaspora–from Mexico, El Salvador, Puerto Rico, Panama, California, New York and Texas. Focused in Baltimore, a city too often defined by a limited, black-and-white conversation with regards to identity, TRACES intends to reframe the conversation and broaden its parameters. By shining light on the emerging Latin American population and contemporary art scene, TRACES aims to facilitate needed discourse around the Latin American experience in the United States and issues relating to cultural essentialism, acculturation, and assimilation. Through visual art and performance, TRACES unpacks the connections between one’s environment, heritage, and experience. Using digital media, photography, sculpture, fiber, and other approaches, the artists investigate traces of their own histories and influences in relation to current art trends. An exhibition co-curated by Sarah Tanguy and Stewart Watson and featuring the works of seventeen artists chosen from studio visits throughout Area 405's accompanying Oliver Street Studios. Amy Boone McCreesh, Antonio McAfee, Benjamin Piwowar, Breon Gilleran, David Page, David Ubias, Jackie Milad, James Vose, Joshua Wade Smith, Kyle Tata, Laura White, Liz Donadio, Margaret Rogers, Mary Anne Arntzen, Paul Jeanes, Steven Pearson, Zoe Friedman. The cumulative biographies and exhibition records of this group of artists are astounding. They are Trawick Prize winners, Sondheim Prize Finalists & Semifinalists, many have having exhibited at The Walters Art Museum, The Baltimore Museum of Art, The Evergreen Museum, and too many exhibition spaces and university galleries to count. essays, she has written for The Washington Times, Sculpture, New Art Examiner, Glass, American Craft, Metalsmith, Urbanite, Hand Print Workshop International, Turning Points, Mid-Atlantic Country, Baltimore, and Readers Digest. As an AIE curator, Tanguy has created over 75 exhibitions of American art for U.S. ambassadorial residences overseas since fall 2004. She has also curated four art collections for the public areas of the new US embassies in Addis Ababa, Helsinki, Monrovia, and Sarajevo, and is currently working on the art collections for Ankara, Athens, Moscow, Niamey, Oslo, Taipei, and The Hague. The exhibitions and collections bring together works by contemporary U.S. and host country artists around shared themes, and include painting, sculpture, photography, mixed media and new media work, and works on paper. The daughter of a diplomat, Tanguy was born in Penang, Malaysia. She has a Bachelor of Arts degree in Fine Arts from Georgetown University. While working on her a Master of Art degree in Art History from the University of North Carolina, Chapel Hill, she returned to Washington, D.C., as a summer intern at the Hirshhorn Museum and Sculpture Garden. Thereafter, she has worked at the National Gallery, the International Exhibitions Foundation, The Tremaine Collection, the International Sculpture Center, the Smithsonian Institution Traveling Exhibition Service, The Hechinger Collection, and Art in Embassies. Area 405 is proud to be a part of the New Day Campaign, a series of 15 exhibitions and 60 events throughout the Baltimore region. This initiative uses art to challenge stigma and discrimination associated with mental illness and addiction, making the world a more healing place. Together we can show where stigma ends and healing begins. Join us this fall. What pain looks like when one is suffering with mental illness or addiction, or affected by a loved one’s hurting, and what flows from that pain. How might we find a place of compassion to become part of the solution rather than contributing to the suffering? First the Pain II features a new and immersive video and sound installation by Phylicia Ghee and new and existing works representing the theme through drawing, painting, print making, and photography by artists Jenna Kahn, Michelle Labonte, Ashley Minner, Nicolette Norman, Lydia Pettit, Alyse Ruriani,Emma Jo Shatto and Laura Weiner. Opening Reception for First the Pain II is part of the Healing Experiences Series and includes a performance of Intrepid I. In conjunction with the exhibition First the Pain II, New Day Campaign’s resident healing artist, Phylicia Ghee, performs and presents others in performing Intrepid, a full-body drawing and healing experience about letting go and letting in. WHAT: On Saturday, May 2, 2015, fifteen youths ages 8-18 from Baltimore's Cherry Hill Homes, Albemarle Square, and other parts of the city will be publicly inducted into the Tosh Roots Reggae Youth Cohort as part of the Youth Resiliency Institute's Baltimore Guitarist's Against Violence (BGAV) program. "It is apparent even more so, as evidenced by the violence and social unrest displayed on Monday following the funeral of Freddie Gray that Baltimore City does not have a youth problem, it has an adult problem. Providing outlets for our youth is a responsibility of adults in order to protect our youth." said Fanon Hill, co-founder of the Youth Resiliency Institute, along with his wife, Navasha Daya. BGAV Cohort members will have the opportunity to make their own guitars under the tutelage of musician and instrument maker Abu the Flutemaker; learn guitar basics from master guitarists; perform roots reggae concerts throughout Baltimore City beginning in September; and learn about legendary reggae artist Peter Tosh's life, music, and his example of responding to police brutality through art, not counter -productive violence. Students will research and learn from incidents of police brutality and intimidation that have plagued impoverished Black communities throughout Baltimore. Students will also attend Baltimore Police Department monthly Community Relations Council meetings familiarizing themselves with the organizational structural of each Baltimore City police district. BGAV curricula honors the traditions, history and restorative capacity of the neighborhoods students live in, while demonstrating the power of reconciliation, forgiveness and conflict mediation through special visits from relatives of homicide victims and anti-violence activists. "Imagine a Baltimore City where it was as easy to get a guitar as it is to get a gun," said Hill. "As cultural arts organizers and artists we need to go on the offensive and provide youth with opportunities to create art, fresh imagery and original songs that corroborate their experiences and challenge the status quo in Baltimore's cultural arts community." The event is free and open to the public and will feature guest speaker Niambe McIntosh, daughter of reggae legend Peter Tosh and administrator of her father's estate. McIntosh will speak about her father and his legacy, with an eye to the importance of that legacy for young people living in difficult circumstances. According to Hill, "Peter Tosh had a lot of swagger, as you might say, but he never was a violent person. He never resorted to violence. Although he spoke about issues related to police brutality, he fought with his music, with his art form." WHEN: Saturday, May 2, beginning at 12:30 p.m.
For more information, contact Fanon Hill at fanon@youthresiliencyinstitute.org or (443) 934-1972. The Youth Resiliency Institute is a program under the umbrella of Fusion Partnerships, Inc., a 501(c)(3) non-profit organization registered in the state of Maryland. A night in two parts: A rousing telling of the story of the exodus from Egypt during a festive meal and Holy Hallel After Party. What is a Holy Hallel After Party? Your favorite pesadich desserts, potato vodka cocktails and a rock-n-roll performance of Hallel- a collection of psalms put together to be sung during joyous occasions on the Hebrew Calendar. A 2 day Market Extravaganza featuring over two dozen fine artists and crafts people from across the region. Join City Ranch as they celebrate five years of equine services in Baltimore! Since its founding in 2007, City Ranch has been dedicated to giving urban children lifelong memories on the backs of horses and providing accessible and affordable horseback riding to the greater Baltimore community. In doing so, we hope to develop positive character in children through horsemanship and to bring the joy of horseback riding to the urban environment. Dancing from 9 to 11:30 PM. Free set-ups, wine, hors d'oeuvres and champagne! A donation of $30.99 gets you in on the fun. Click here to donate. Process is an exhibition of artwork by Baltimore City College Students enrolled in the International Baccalaureate Visual Arts Program. Featuring the the work of both Juniors and Seniors, the exhibit will not only showcase student artwork, but through an examination of the process and preparations IB students practice, will illustrate the philosophy and mission of the International Baccalaureate program. The International Baccalaureate aims to develop inquiring, knowledgeable and caring young people who help to create a better and more peaceful world through intercultural understanding and respect. City College is the only Baltimore public high school to offer the IB program. This joint venture between Area 405 and City College's Art Department seeks to give these exceptional students of our public school system the opportunity to show their work outside of the classroom, as well as introduce the IB program to the population at large.